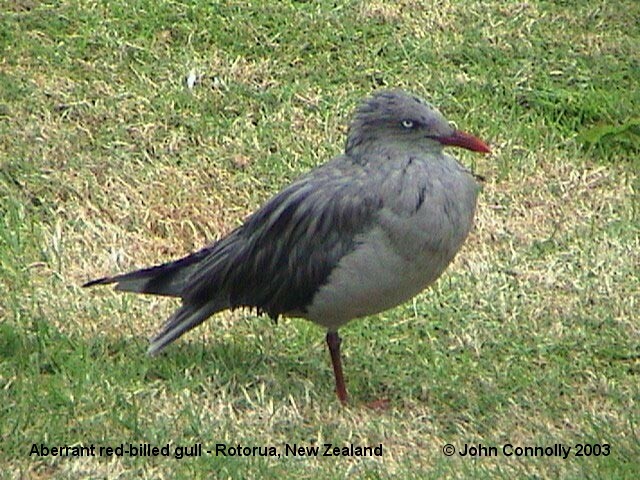 On 22 December 2003, Tim Barnard posted an email to BIRDING-NZ about a couple of unusual adult red-billed gulls at Rotorua. He described their plumage as “completely grey with no traces of white” and said that they were sometimes around the lake front or at the nesting sites in Sulphur Bay. Subsequently, John Connolly emailed me on 31 December 2003 with the photo shown below. He said there was more than one, and they were on the waterfront at Rotorua, on the lawns just off Memorial Drive, near the corner of Motutara Golf Course. John took the below picture on 22 November 2003, so the birds are obviously hanging around. Aberrant red-billed gull, photographed at the Rotorua lakefront on 22 November 2003. Since this sighting at Rotorua, another bird was photographed at Waikanae, on one of the lagoons by the river mouth. 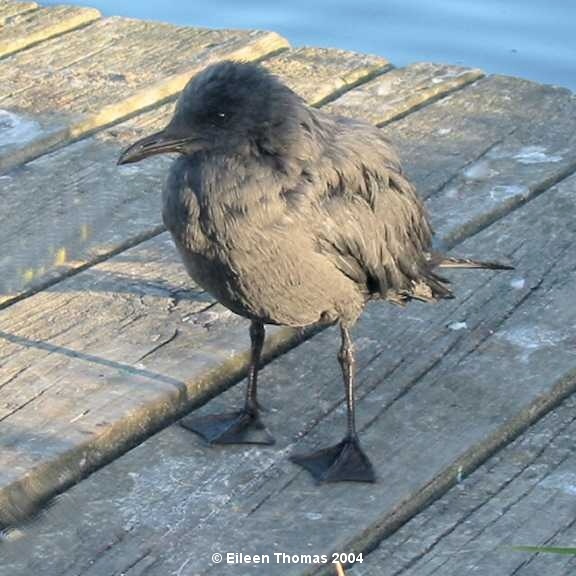 The bird was seen and photographed by Eileen Thomas on 9 March 2004. It didn’t appear sick, was not oiled, and could fly ok. It seems to be a juvenile bird – due to the colour of the eyes, and bill and legs. Further sightings of birds such as this would be welcomed. This is certainly a very interesting plumage, and thoughts/discussion would be welcomed. Has anyone ever seen a red-billed gull (or any other gull for that matter) with such colouration? Email us here.